Memory can play many tricks on you which is one of the reasons I am glad I kept diaries (and still do). I don’t know when it started but I started to think that the Saturday night of the Stonewall riot Bernie and I had been at a play on Broadway and when we got home I heard about it on the news and the next day read a blurb about it in the paper. At the time we lived on 33rd Street right off 3rd Avenue. We often would walk down to the Village and we decided to stroll down there and take a look. I don’t remember a thing except that the area seemed all quiet and there were more police than usual. After writing my review of the “Stonewall” movie I thought I would look up what play we had seen. I have a lot of entries for that month as on June 24 Bernie signed the papers for getting the Weight Watchers franchise for Memphis and was going down there July 1 and I would meet him there the 4th of July weekend. It was Bernie’s birthday on the 19th and we, Addie, Joan, Monty, Art and Alex, gave him a party. I wasn’t with Bernie, I didn’t see a play and now 46 years later I remember nothing about that time except getting ready to change my life by moving to Memphis. I have read comments by people who weren’t there, aren’t old enough to have been there and certainly haven’t seen the movie talking trash about it and, yet, here I am 46 years later who obviously didn’t think it was important enough to make even a PS in my diary about that infamous, important part of Gay history. Going into the movie I knew it would be a ‘Hollywood’ version but also what the director and writer would research and/or remember. Some comments made by people about the movie concern the accuracy of what it shows. Do you really think the movies about the Alamo or biographies or the current “Black Mass” or the many ‘based on a true story’ are accurate? Was the recent movie “Selma” the truth or was it embellished? Tell the whole truth and nothing but the truth? Do you really think all the people who claim to have been there that night were really there or has memory played a trick on them? Yes I was a member of the Mattachine Society and I subscribed to One magazine--even wrote a couple articles for them--and for at least 12 years was a gay activist and met some of the people shown and/or referred to in the film but I sat in the theatre and learned/saw what essentially happened that evening, a lot I may have forgotten, and I feel the movie represents a defining moment in gay history that all gay people should know and all nongay people could learn from as to why there is Gay Pride and understand why every year Gays march to remember this event. 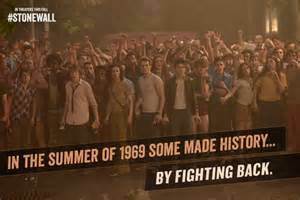 Agree with me or not that “Stonewall” is a must see movie first see it!